As requested! The super easy (reversible) Christmas stocking tutorial! 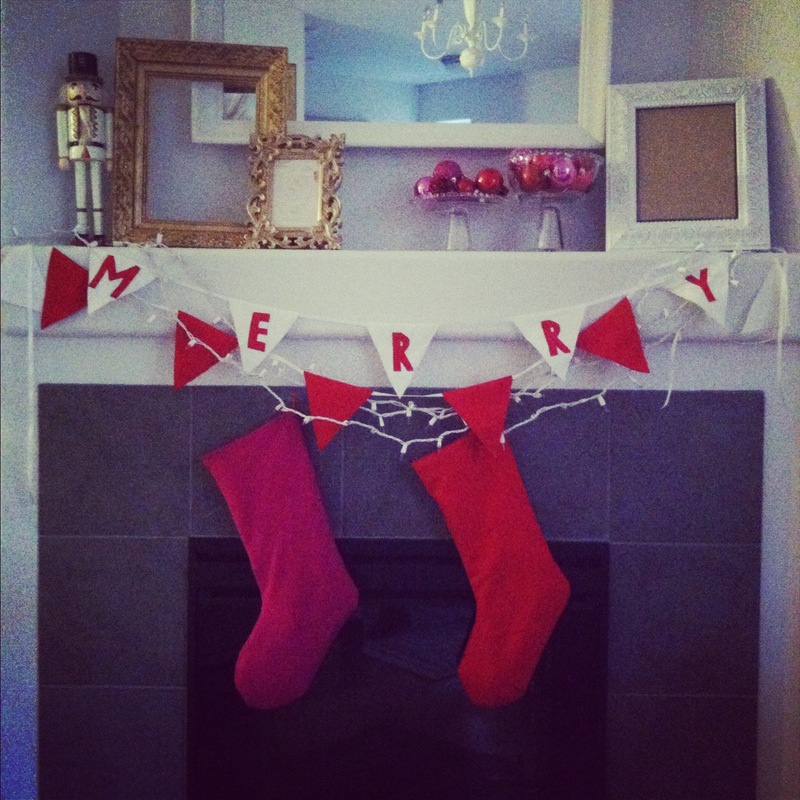 Get ready for a super easy tutorial for a Christmas stocking to hang--it's even reversible! Yay, finally got this posted! A couple weeks ago I mentioned I was thinking of making us some Christmas stockings since I can't find the right ones, and we ought to have something hanging on the fireplace! Aside from hanging actual socks... so I made these up, and my friend pointed out that she was hoping to make reversible stockings as gifts/gift bags this year--and I said hey, I have the perfect tutorial coming up! Because these could totally be reversible, if you used fabrics you liked for both the inside and outside. For mine, I pulled out some great red woven cotton, diamond-ey pattern woven into it and pretty heavy weight, that I got at Goodwill for super cheap a while back. I love the variety of fabric you can find at thrift shops. =) I wanted to coordinate with our bright pink and red theme, so used some hot pink lightweight crinkle-ey poly for the lining (mine's not meant to be reversible, it'll just peek out at the top). I used an old stocking (made in 2009 from a thrifted wool plaid skirt!) as a pattern. 1. Cut 2 outside stockings. Using your old stocking as a pattern, cut around it adding a 1/2" to 5/8" seam allowance, whichever you prefer. Make sure to follow the grain of the fabric--mine was plaid so it's easy to see, but try to find the straight grain of the stocking you're copying and make it parallel to the selvage or edge of your new fabric. Most stockings angle a little rather than pointing straight down until the heel. 2. Cut out two inside stocking pieces, using the piece you just cut as a pattern and cutting around it exactly. 3. Sew the short seams together on both pieces--that's the top of the stocking edge. Press your seam allowances to one side. 4. Now you should have two very long, awkwardly shaped double stocking things. Sew them together, right sides together with both linings and both outside fabrics together. Sew around the entire shape except for a small opening--I did a 2" opening at the bottom of the foot of the lining. If you're making a reversible stocking that you'll want to use both sides of, you might want to leave your opening along the straighter edge of the back/outside of the ankle. 5. Clip along your seam allowance at the curves--on both the lining and outer fabric sides, outer and inner curves. 6. Turn your stocking right side out! Flip from the small opening you left in the seam, in the lining/inner fabric. 7. Do your best to press your seams flat or to one side. 8. Top stitch your lining opening closed. Again, mine is in the toe of my lining layer, but yours could be along the side if you want to reverse your stocking and show off the smooth seams along the curvy foot part. 9. Flip your lining back around your arm, tucking it into the stocking. See? Miraculous, it's one piece with no edges showing! 10. Press the top edge seam down, keeping the opening of the stocking smooth and flat. If you're like me, and forgot to tuck the loop into the seam before making my long, enclosed shape, you can make a loop of ribbon and do a tight zigzag stitch to attach it to the outside corner of the stocking where it hangs. Ta-da! I also made a hot pink one from some wool I had left over from a vintage skirt makeover. Same pink lining, same style... they're a pair. =) I love them hanging on our fireplace (still need to get some stocking hooks), right under our (same red fabric) holiday triangle bunting and festive lights. I made stockings using this same method! In fact, I'm posting mine today. (Not posted yet though). Love the idea of making your own stocking, these look really easy too. I still have a stocking my mom made for me when I was a baby. I think homemade stuff is definitely more sentimental. Oh man that is so cute and simple. Your blog makes me excited to learn to sew!